Tired of the same old glazed salmon recipes? 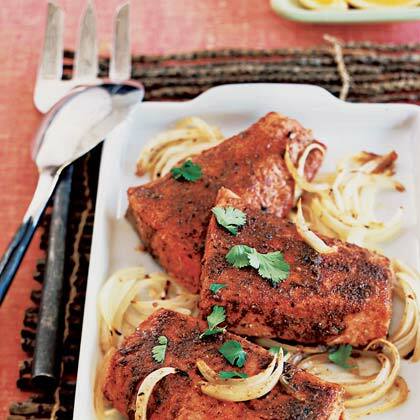 Try this Indian-inspired salmon recipe featuring seasonings like fennel, coriander, cumin, and cloves. Rinse salmon and pat dry. Line a 12- by 18-inch baking pan with foil and set pieces, skin down, 1 inch apart in pan. Scatter onions around salmon. In a small bowl, stir together butter, brown sugar, coriander, fennel seeds, cayenne, cardamom, cumin, salt, pepper, cloves, and cinnamon. Stir in lemon juice. Brush mixture evenly over tops and sides of salmon pieces. Bake in a 400° oven for 15 minutes. Turn oven to broil; broil salmon 6 inches from heat until top is bubbling and well browned and fish is opaque but still moist-looking in the center of the thickest part (cut to test), 4 to 6 minutes. With a spatula, transfer salmon pieces to a serving dish (leave skin behind) and surround with onions. Sprinkle with cilantro and garnish with lemon wedges.